ARLINGTON, Va. — With extremely cold temperatures in the forecast, don’t forget about your fur babies. “It is imperative that pets are brought inside,” Jennifer Toussaint, chief of Animal Control at the Animal Welfare League of Arlington, told WTOP. “Dogs should be monitored when outside using the restroom. This is the time to maybe do a quick leash walk instead of putting the dog into the backyard. We also advise during inclement weather like this that gating or fencing could become unsecured with winds,” she said. In Virginia, leaving your pet without adequate care or shelter in the cold could lead to animal cruelty charges punishable by up to one year in jail. “Moving through this next week if … it’s brought to our attention that your pet is left outside and we respond and you are not present, if we believe your pet’s health is at risk we will be seizing the animal,” said Toussaint. Also keep in mind that if you walk your dog on a sidewalk that’s been treated with salt or other chemicals, it may burn your pup’s feet. “Those can be extremely caustic to pets,” Toussaint said, adding that you should clean off your dog’s feet right away once they come back inside, so that Buster doesn’t lick the salt off himself. 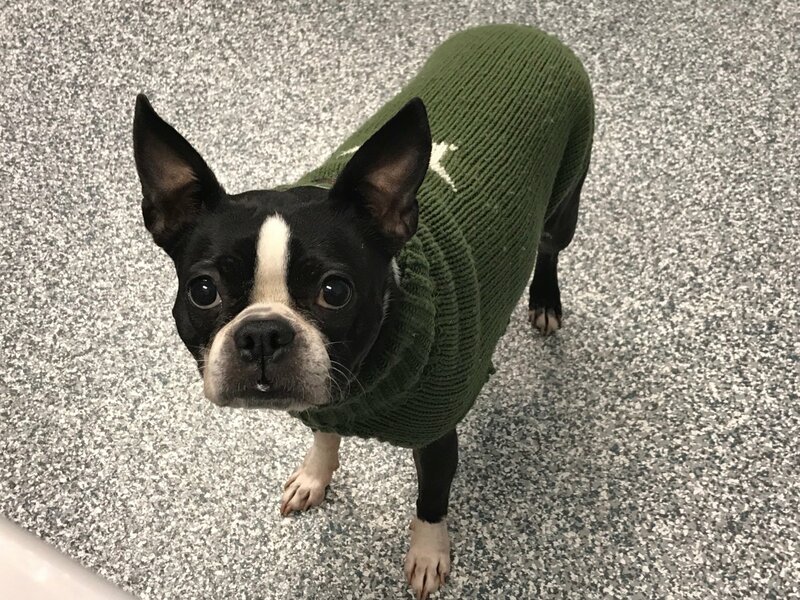 Sweaters and coats for dogs have become more and more popular, so are they really necessary? “I always say, it never hurts to err on the side of caution, so if it’s going to be frigid and you have a sweater to put on your pet briefly to take it outside, it’s probably a great solution,” said Toussaint. Alternatively, if you have a dog with a very thick coat, such as a Siberian Husky, Toussaint said that’s no excuse to leave him out in frigid weather. In weather this cold, she said, keep your eyes open for animals around your neighborhood. In Arlington County, you can reach Animal Control at any time, every day of the year by calling 703-931-9241.